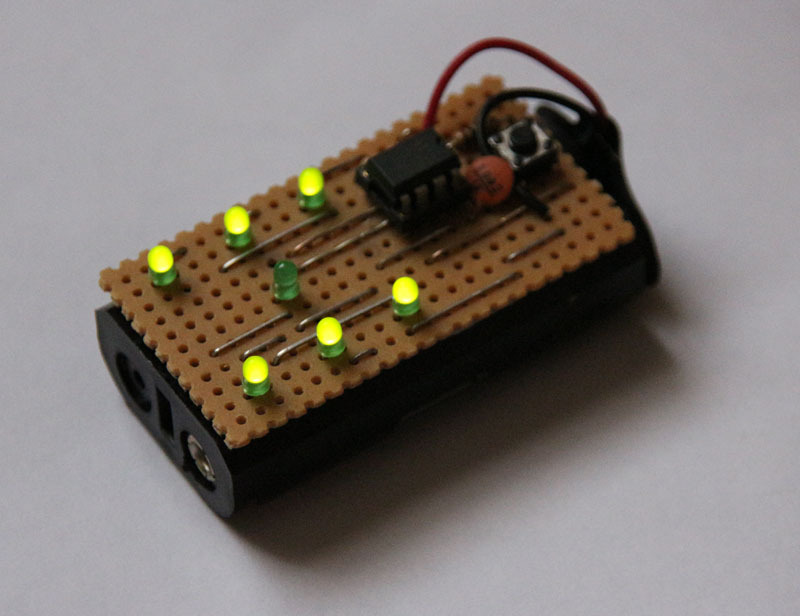 In part 1 we implemented a simple electronic dice using an Arduino (R3). Part 2 implements the same (slightly enhanced) dice using a PIC 12F629 microcontroller. So, why use a stand-alone microcontroller rather than an Arduino? Several reasons; the PIC 12F629 is a lot cheaper than an Arduino (its even cheaper than the AVR chip that the Arduino is based upon), it’s 8-pin DIL package makes it a lot smaller than an Arduino, and finally, it uses a lot less power than an Arduino. The LEDs and their matching resistors are connected to GPIO pins configured as outputs in much the same way as before. One thing to watch out for is that while the Arduino can sink/source up to 40mA per pin, the PIC can only manage 25mA. This isn’t a problem here as 25mA is more than enough to drive pairs of the 3mm LEDs with their built in resistors. 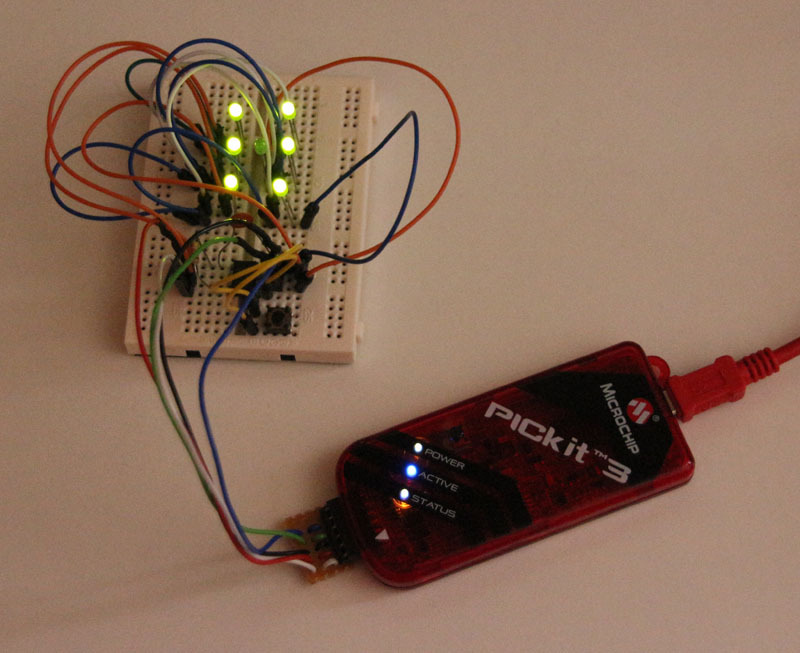 The push-button switch is connected between ground and a GPIO pin configured as an input that is being pulled high with an external 10k resistor. Yes, PICs do have built in pull-ups, but I’ve not used them here (read on to see why!). The reset pin is also being pulled high with an external 10k resistor. This pin can be configured as an GPIO with the reset being held high with an internal 10k resistor, but there’s a weird issue regarding the 12F629 that means it’s best to use an external pull-up on reset if you’re; a) planning to also use the internal oscillator, and b) programming the PIC with a PICkit 3 programmer. The 0.1uF capacitor across the supply pins is to filter out any noise in the power supply (probably unnecessary in this case as I’m powering the whole thing from a battery). ; '__CONFIG' directive is used to embed configuration word within .asm file. ; The lables following the directive are located in the respective .inc file. ; See data sheet for additional information on configuration word settings. The design makes use of the low-power feature of the 12F629 which allows it to be permanently connected to a battery without draining it quickly. I tried measuring the current draw while in its powered-down state, but my digital meter simply doesn’t go that low (we’re talking nano-amps!). Firstly, I simply couldn’t understand why the device was drawing so much current in power-down mode. Even with all the LEDs turned off, and only using external pull-ups (as per the docs) it was still drawing too much current – not a vast amount, but enough the drain the batteries in about 6 weeks. Upon reading the docs in more detail I read that the brown-out detect circuit uses a fair amount of current – once that was disabled the current draw fell to an amount I could’t even measure. Secondly, sometimes after displaying the required random number pattern it would immediately display the pattern for a ‘1’ without the button being pressed. I immediately though that it was a switch debouncing issue, and I was right, but not in the way I initially thought. While I’d set up the button detection correctly – enabling interrupts on a falling edge of INT (pin 5) while disabling global interrupts – I hadn’t realised that the falling edge was being detected while not in power-down mode, and was ‘remembered’ when power-down was entered causing an immediate re-triggering. A simple test after the sleep instruction rejected these false triggerings.